However, there will be many instances where you just need one or two new coupons quickly. For example, you offer a 20% off coupon to first-time purchase customers as a welcome to them. It would be time-consuming and troublesome to go to backend and get the codes created every time a newcomer turns up. This is especially true when you have multiple admins for your store, and you want to be the only one with access to the coupon generator. That’s why there is Quick Coupon Link Generator. 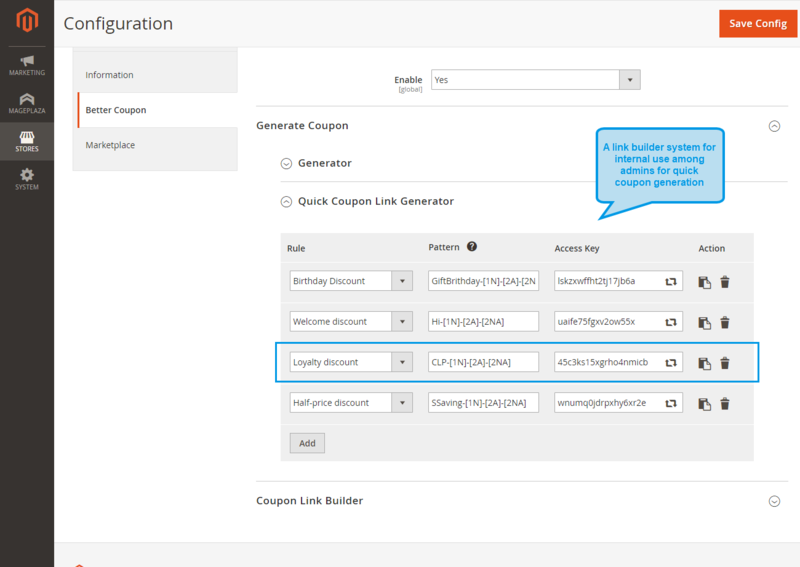 It generates links that will give you a random coupon code in accordance to the rule you set every time you access the link.This way, you can quickly grab several coupons without ever need to go to backend, and you can share the link with your admins and enable them to create coupons as well. Plus, by entering email addresses into the link, the link holder can instantly send the generated code to customers. Learn more: How to applied multiple coupon in Magento 2. To find it, simply go to backend, then on the admin panel go to Stores > Configuration > Mageplaza > Better Coupon > Generate Coupon. There, below the Generator, you will find the “Quick Coupon Link Generator”. Don’t forget to turn the module on first for the Link Generator to work. Let us walk through all of its components. First, we have the “Rule” column, this is where you choose the rule for your coupon from a drop down list. If you don’t find the rule you want, make sure that it is configured first in Marketing > Cart Price Rules. Next to it is the “Pattern” column. This is where you customize your coupon by telling the Generator what pattern you want. If you want 3 random letters, type in [3A]. If you want 3 random numbers, type in [3N]. If you want a combination of both, then type in [3AN]. Anything else you write in the field will be kept as it. For example, to make a welcome coupon, you type in HELLO-[3A]-[3N]-[3AN]. The result is a coupon beginning with “HELLO-” and followed by a random code, such as HELLO-IFY-274-7YH. If you don’t want to bother with a pattern, just leave the field blank. Your coupon will use the default pattern, which is a string of 12 random numbers. On the third column, we have the “Access Key”. This is where you will find the link to the generator. Finally, on the Action column is where you can get the link by simply clicking on the copy-paste symbol. Also, you can delete old links so no new coupons can be created from them. You can also create multiple generator links at the same time by simply clicking on the “Add” button at the bottom of the table. At the last step, remember to save the configuration, otherwise your changes won’t be applied to the generator link. To get the coupon code, you just need to simply go to the URL and refresh it for a new code. Better yet, this feature can be used with the Pre-applied coupon Link to create a satisfying shopping experience.